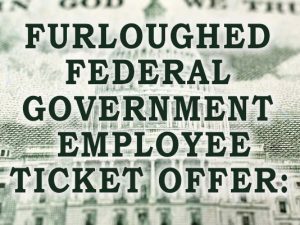 Are You a Furloughed Federal Government Employee? Visit Raue Box Office | 26 N Williams Street Crystal Lake, IL 60014 or call 815.356.9212.
duration of the shutdown. Offer not available through the website. One offer per valid ID, please. click below for complete details and levels. Gift certificates can be purchased for any dollar amount and are redeemable for tickets to any Raue Center production. If the total amount of the gift certificate is not used for the first transaction, the remaining balance can still be applied to future ticket purchases. Gift certificates are available by calling the Box Office at 815.356.9212. Tickets are non-refundable and non-exchangeable. Raue Center does not offer refunds on tickets purchased even if the performance is canceled or postponed. In the event of cancellation due to acts of god or weather, Raue Center will strive to reschedule the event but it is clearly understood that the cancellation might not be possible with the Artist. In the event the performance cannot be rescheduled, a credit for a future Raue Center show(s) will be issued. Please contact the Box Office for more information.